These beautiful cuff links for your Dad will bring tears to his eyes and he will wear them proudly as he walks you down the aisle on your wedding day. 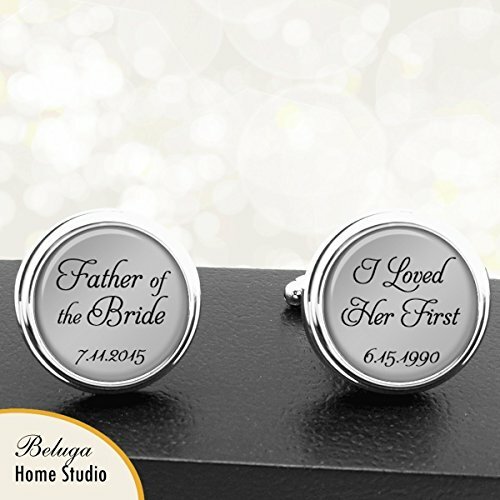 The first cuff link says " Father of the Bride " with your wedding date. The second cuff link says " I loved her first " with the day you were born underneath. The cuff links shown in the listing have a silver background with black text. This can be changed in the optional options menu or by sending me a message. I'd be happy to make the background or the font color anything you would like to match your wedding colors. Two sizes are available. The main listing shows the smaller 3/4 inch size. This is the most popular, traditional size. The graphic area is 16mm (approx 5/8 inch). The larger 1 inch size (22mm area for graphics which is approx 7/8 inch) is perfect for big and tall men and many customers love the larger statement cuff links. At checkout, you will be asked to choose which size you would like. The second and third thumbnail pictures show examples of both sizes. Text and sayings can be modified by request so if you love this design but want to honor your grandfather, or best man or brother or any of the special men in your life, just let me know. Your cuff links are beautifully gift packaged in a high quality black cufflinks box and ready to give as gifts. If you have any questions about this product by BelugaHomeStudio, contact us by completing and submitting the form below. If you are looking for a specif part number, please include it with your message.